This is NEAT. I am sorry that I couldn't get a nice picture of it. It is so much nicer than it looks in the picture. I need to learn how to take pictures of fiber! This is 6 OZ of wool with BLUE JEAN COTTON! So neat! She cut up jeans and put it in herself! My son is amazed with this he loves looking at it. He asked if I could cut up his jeans and put them in wool. I had to tell him that I am still very new to spinning I think it will be years before I will have the skill and knowledge to do things like that. I have to admit I am afraid to try spinning this. I am afraid I am going to mess something up. The White wool is 6 OZ of Superwash. I have never tried to spin super wash so this will also be new for me. THANK YOU SO MUCH Cena Brown! You are very kind! I hope to sneak in spinning time this week! 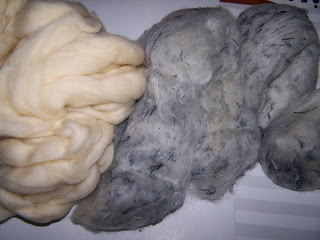 I feel that I am so behind on everything I might not get to spin wool for another week! I hope things slow down in my house SOON! A little more catching up!